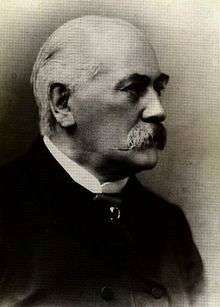 Heinrich Karl Brugsch (also Brugsch-Pasha) (18 February 1827 – 9 September 1894) was a German Egyptologist. He was associated with Auguste Mariette in his excavations at Memphis. He became director of the School of Egyptology at Cairo, producing numerous very valuable works and pioneering the decipherment of Demotic, the simplified script of the later Egyptian periods. Heinrich Karl Brugsch was born in Berlin in 1827. He was the son of a Prussian cavalry officer, and was born in the barracks at Berlin. He early manifested a great inclination to Egyptian studies, in which he was almost entirely self-taught. At the age of 16, he applied himself with success to the decipherment of Demotic, which had been neglected since the death of Champollion in 1832. Brugsch's work, Scriptura Ægyptiorum Demotica (Berlin, 1848), containing the results of his studies, appeared while he was a student at the gymnasium. It was followed by his Numerorum Demoticorum Doctrina (1849), and his Sammlung demotischer Urkunden (1850). His 1848 work brought him to the attention of Alexander von Humboldt and Prussian King Frederick William IV. After completing his university course, support from the king enabled him to complete his studies with visits to foreign museums at Paris, London, Turin, and Leyden. In 1853, he was sent to Egypt by the Prussian government in 1853, and contracted an intimate friendship with Mariette, whom he assisted in his work. After this he returned to Berlin, where, in 1854, he was appointed privatdocent in the university, and, in 1855, assistant in the Egyptian Museum of Berlin. He visited Egypt again in 1857. In 1860 he was sent to Persia on a special mission under Baron Minutoli, travelled over the country, and after Minutoli's death discharged the functions of ambassador. Founder (1863) the Egyptological journal, Zeitschrift für Aegyptische Sprache. In 1864 he was consul at Cairo, in 1868 professor at Göttingen, and in 1870 director of the school of Egyptology, founded at Cairo by the khedive. He was soon raised to the rank of bey (1873), and some time afterward to that of pasha (1881) From this post, he was unceremoniously dismissed in 1879 by the European controllers of the public revenues, determined to economize at all hazards; and French influence prevented his succeeding his friend Mariette at the Bulaq Museum in 1883. He afterwards resided principally in Germany until his death in 1894, but frequently visited Egypt, took part in two more official missions to Persia in 1883 (with Prince Frederick Charles) and 1885. He organized an Egyptian exhibit at the Philadelphia Exposition in 1876. He published his autobiography in 1894, concluding with a warm panegyric upon British rule in Egypt. Brugsch's services to Egyptology are most important, particularly in the decipherment of Demotic and the making of a vast Hieroglyphic-Demotic dictionary (1867–1882). He was buried in Berlin-Charlottenburg. His tombstone is a reused lid of an Egyptian sarcophagus of the Old Kingdom. Brugsch brought some biblical manuscripts from Sinai to Berlin (Minuscule 257, Minuscule 653 and Minuscule 654). The Brugsch Papyrus, also known as the Greater Berlin Papyrus, in the Berlin Museum (Pap. Berl. 3038), an important ancient Egyptian medical papyrus, bears the name of Heinrich Karl Brugsch. It was studied originally by him. 1 2 3 4 5 6 7 8 9 10 11 12 13 14 15 16 Gilman 1905. 1 2 3 4 5 6 7 8 9 Chisholm 1911. This article incorporates text from a publication now in the public domain: Gilman, Daniel Coit; Thurston, H. T.; Colby, F. M., eds. (1905). "Brugsch, Heinrich Karl". New International Encyclopedia (1st ed.). New York: Dodd, Mead. This article incorporates text from a publication now in the public domain: Chisholm, Hugh, ed. (1911). "Brugsch, Heinrich Karl". Encyclopædia Britannica. 4 (11th ed.). Cambridge University Press. p. 679. Heinrich Brugsch, My Life and My Travels. Berlin, 1894 (English translation, 1992). 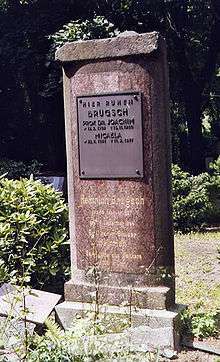 "Brugsch, Heinrich Karl". Encyclopedia Americana. 1920. Wikimedia Commons has media related to Heinrich Brugsch.